The Logan Creek Lodge is situated in the beautiful Sapphire Valley Resort, and just a short walk to 3 swimming pools (one is indoor and open year round), snow ski slope, free miniature golf, gem mining, arcade room, fitness center, tennis courts, 9 hole par 3 golf, large activity field with kids playground, Horsepasture River, river walking trail, next door to Mica's Restaurant. Great for groups. 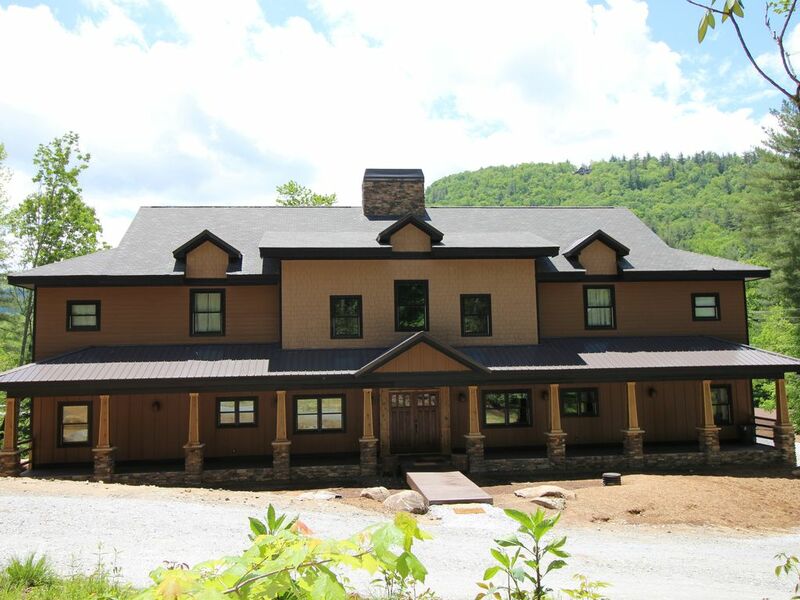 The Lodge consists of a Grand Master Bedroom on the main floor that is handicap friendly, with a large walk in (and roll-in) shower, king bed, and a view of the ski slope. Upstairs are 4 King bedrooms with their own large bathrooms (tub, walk in shower, vanity, private water closet). In the basement area are 2 large bunk rooms that sleep 8 in each bunk room (2 queen beds, 4 single beds). These bunk rooms also have their own spacious bathroom areas with 2 private water closets, tub/shower, walk in shower, and double sink in each of the two bathrooms. Also in the basement area is a billiard table, ping pong table, game table, tv watching area, kitchenette, and a 15 seat luxury home theater room with a 150" wide screen to watch movies the way they were intended to watch. On the main floor is a beautiful deck with a hanging day bed, firepit table, and 7 person hot tub. Also is a 4 season sunroom, dining table for 10, 5 seat island bar, and comfortable seating in the great room for 12. There is also a study with printer and high speed internet throughout the house, as well as a laundry room with double Speed Queen washer/dryer combos.